Greetings from your WoodWeek news team. This week we have lots of updates on the industry. Midweek the hot story is a report released yesterday by Simon Upton, Parliamentary Commissioner for the Environment. The new environmental report released this week says only farming should be able to offset its greenhouse gas emissions using forests as sinks, a new climate change report recommends. Businesses that burn fossil fuels and create dangerous carbon dioxide need to reduce their emissions to a net zero as soon as possible, Simon Upton said. Clearly, Federated Farmers were "delighted" Upton had recognised the fundamental difference between carbon dioxide and shorter term methane and nitrous oxide (biological) emissions. However Climate Change Minister James Shaw rejected the recommendation, saying forestry made sense given the tiny window of time to seriously fight climate change. Forest Owners Association called for clarification by the government. We have several points of view and an objective piece from Newsroom this morning. A forest contractor survey has found that contracting companies in logging and silviculture in the East Coast, Hawkes Bay and Lower North Island regions experienced the highest growth in business over the past 12 months and also foresee strong future growth. Contractors in the Bay of Plenty, Taranaki, Waikato and Otago expect a more challenging business landscape over the next 12 months. See more below. Four forestry companies operating in the Wairarapa region of New Zealand have announced the formation of Log Distribution Limited, a joint venture company which will commence operations next week. 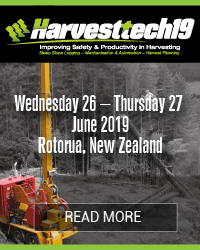 For those of you wanting to catch up with the latest in primary industry technology developments, make sure you register to attend our MobileTECH event running next week in Rotorua. Nearly 300 primary industry leaders are registered. Our 2-day programme is packed full of innovative digital technologies, practical case studies and key discussions from experts and producers throughout the primary sector. They will provide vital insights on how the agricultural, horticultural and forestry industries can best utilise digital technologies to drive real productivity. Finally, the ongoing title of tallest timber building in the world is a bit of media fascination, but we’re up for it too. Check out the new leader – it’s a wonderful setting for a tall timber structure too, set beside a lake in a small town. While we’ve got you, be sure to mark your diary for our 4th annual WoodWorks - Changing Perceptions Conference running on 3-4 September in Rotorua. By then we’ll have plenty more case studies to showcase. PCE report needs clarity from Government says Forest Owners Association - Forest Owners want clarity for what New Zealand plantation forestry is expected to deliver on climate change targets. The Parliamentary Commissioner for the Environment, Simon Upton, has just issued a report which downplays the contribution of forestry in sequestering atmospheric carbon, and instead wants to drive down fossil fuel use. But the Forest Owners Association President, Peter Weir, says Simon Upton is contradicting the Productivity Commission’s report earlier this year which pointed to planting trees serving as carbon sinks as the main means of getting New Zealand to carbon neutrality by 2050. Peter Weir says that Simon Upton is correct in that forestry can’t offer climate change solutions indefinitely. The President of the Farm Forestry Association, Neil Cullen, also wants the government direction to be clear. “We have a concern that there is a proposal from the PCE to restrict forestry offsets. If the government decided to follow this and limit offsets to agriculture, then this would have a dramatic negative impact on the value of carbon units, reduce planting rates and perpetuating the seesaw policy that forestry has been experiencing for too long,” Neil Cullen says. He also points to the Interim Climate Change Panel coming up with yet another set of formulas for addressing greenhouse gas emissions. The industry-focused team at Toi Ohomai Institute of Technology has recently completed another update of their New Zealand Forestry Contractors Business Review - The results are summarised below and a copy of their latest full report is attached. New Zealand has shifted 3 billion tons of carbon from the land to the atmosphere by clearing forests for farming, says a report by Environment Commissioner Simon Upton. Now Upton thinks farmers should have dibs on planting new trees to offset their greenhouse emissions – arguing CO2 from cars and industry is too long-lived to be dealt with using forestry credits. Even before the embargo lifted on Simon Upton’s long-awaited climate policy report, the Minister for Climate Change had ruled out its boldest suggestion. The Parliamentary Commissioner for the Environment proposes stopping New Zealand’s carbon dioxide emitters from using forestry planting as a convenient way to avoid cutting their actual emissions, as they’ve been doing ever since New Zealand signed up to the Kyoto Protocol. Upton proposes shutting carbon emitters out of purchasing tree-planting credits -- instead ring-fencing the nation’s forest sinks for the exclusive use of farmers. From the perspective of the climate, there’s logic to this: carbon dioxide can stick around warming the planet for centuries, while forests, particularly plantation pine forests, come and go. In Upton’s view this makes tree planting better suited to off-setting the climate effects of more temporary greenhouse gases, such as farming’s methane and nitrous oxide. Without any forest offsets to help them get to net zero emissions, people and industries making carbon dioxide from cars, coal, steel-making and other things would need to make even deeper cuts, and likely couldn’t reach absolute zero emissions by 2050. Upton says 2075 might be a more realistic date to get to absolute zero. Methane and nitrous oxide, meanwhile, would be cut by whatever amount the Climate Commission deems best, but at least by 20 percent, under the report's modelling. If New Zealand continues with its current plan of lumping all gases and sinks together it risks claiming hollow “accounting victory” over its emissions, and cutting real carbon emissions slower than we would if we couldn't rely on using forests to count against our carbon emissions, he says. NZ greenhouse gas emitters need to get to zero, except for farming, PCE recommends - Only farming should be able to offset its greenhouse gas emissions using forests as sinks, a new climate change report recommends. Businesses which burn fossil fuels and create dangerous carbon dioxide need to reduce their emissions to a net zero as soon as possible, the Parliamentary Commissioner for the Environment Simon Upton said. Federated Farmers said they were "delighted" Upton had recognised the fundamental difference between carbon dioxide and shorter term methane and nitrous oxide (biological) emissions. However Climate Change Minister James Shaw rejected the recommendation, saying forestry made sense given the tiny window of time to seriously fight climate change. Most carbon dioxide emissions come from transport, electricity generation or businesses using coal or gas in boilers. It is regarded as the most dangerous greenhouse gas, lingering in the atmosphere for thousands of years. Upton said if these businesses wanted to offset their emissions, they should look to means other than planting forests, but more importantly they should look at ways of reducing emissions. He recommends the two-pronged approach in the report entitled Farms, Forests and Fossil Fuels: The next great landscape transformation. * Develop two separate targets for the second half of the century: a zero gross fossil emissions target to be legislated as part of the establishment of the new Climate Commission; and a reduction target for biological emissions to be recommended by the new Commission and subsequently legislated. * Allow access to forest sinks as offsets only for biological emissions on a basis to be advised by the Climate Commission. * Develop the tools needed to manage biological sources and sinks in the context of a landscape-based approach that embraces water, soil and biodiversity objectives. Upton suggested the current date of 2050 to attain net zero carbon emissions would still be consistent with the Paris Agreement and "should not be ruled out if that is considered to be a more credible and achievable time frame within which to effect such a significant economic transformation". Four NZ forestry companies unite in joint venture to enable operational efficiencies – Four forestry companies operating in the Wairarapa region of New Zealand have announced the formation of Log Distribution Limited, a joint venture company which will commence operations on 1 April 2019. “We believe the formation of Log Distribution Limited will result in reduced waste across the supply chain and better use of our critical rail and port infrastructure,” Mr Hughes says. Recognising the increased demand to provide the region’s growers with a route to market, Mr Hughes says Log Distribution Limited will place focus on reducing the reliance on road transport over the Remutaka Range and lessen port congestion at Centrepoint Wellington. As New Zealand’s forestry harvest levels continue to grow, Mr Hughes is confident Log Distribution Limited will strengthen the supply chain and deliver a wealth of benefits to stakeholders. “The formation of Log Distribution Limited is a great example of positive collaboration in the forest industry that will benefit both community and industry stakeholders,” Mr Hughes says. The Government will be providing skills training to Northland youth to help them get jobs in the forestry sector with the support of funding from the Provincial Growth Fund in the Eco Toa programme, Minister of Employment Willie Jackson announced on Monday. “This is a training programme that will empower unemployed rangatahi into long- term employment that will have the added benefit of protecting our natural environment. What’s more, these young people will be earning while they are learning so they can continue to support themselves and their wh?nau while going through this programme. 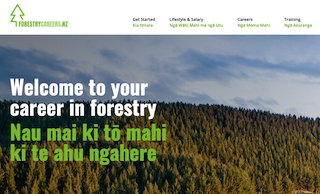 A new web portal - ‘ForestryCareers.NZ’ - was launched in mid March by the Forest Growers Levy Trust (FGLT). The portal is a comprehensive starting point for anyone interested in forestry education, training and careers, providing information and directing users to other relevant websites and sources of information. The facility is “long overdue” according to Fraser Field, a member of the FGLT Training and Careers Committee (TCC) and forestry training manager. The TCC has overseen the development of the web portal, and will keep the site up-to-date into the future. The web portal contains information about the myriad of career opportunities in forestry. It covers options from practical roles in silviculture and harvesting to forest management, engineering, surveying, research, administration, human resource management, IT and others. Information is provided about over 30 types of jobs, with an outline of the work involved, salary range, and what training or education might be needed to match the particular job. A comprehensive ‘Training’ section details the many regional and national education and training courses on offer, again covering the full range from entry level practical and academic courses through options for further training mid- career to ideas for people thinking of moving into forestry from other sectors.. There are links to the various course providers’ websites and contact people. A surprisingly large number of scholarships, awards and other assistance packages are available for education and training at every level in the industry: the portal provides a starting point to help people seek these out. Glen Mackie, secretary of the TCC and a key contributor to the website’s design and development, says another benefit is that the portal will provide a fund of resources for school careers advisers or anyone else who needs information about forestry careers, education and training. “We have a great collection of videos and other resources,” says Glen, “and these are going to be accessible and downloadable for people running careers and recruitment events for example. There’s also some background information on the industry, and some ‘myth-busters’, which we hope will help dispel some of the negative impressions that tend to blight attempts to recruit new entrants.” One myth that is definitely dispelled is that forestry is a low-income sector, with potential wages at all levels looking very competitive. While most of the world’s high rise buildings are not made of wood, there is some fascination with the ones starting to rise up using CLT and other engineered wood products for both its structural and aesthetic values. 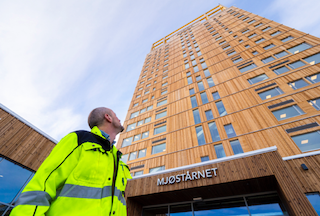 In the small Norwegian town of Brumunddal (population: 10,000-ish) residents seem ready to enjoy their moment in the spotlight now that Mjøstårnet, the newly minted tallest timber tower in the world, has been completed. It's certainly been hyped enough. Up until Mjøstårnet was officially designated as the tallest timber building in the world (standing 85 metres high) by the Council on Tall Buildings and Urban Habitat, the title belonged to Brock Commons Tallwood House, a wood-concrete hybrid high-rise dormitory that towers 174 feet (53 metres) over the campus of the University of British Columbia in Vancouver. That's significant growth as far as timber towers go — more than a 100-foot leap from once tallest to new tallest. Also very tall are Treet, an all-wood apartment building in Bergen, Norway, standing nearly 161 feet (49 metres) tall and a 147-foot-tall (45 metres) wooden office block in Brisbane, Australia. Per Dezeen, the mixed-use lakeside building, which includes 32 rental apartments, five floors of office space, a restaurant and the aptly named 72-room Wood Hotel, is also, somewhat surprisingly, the third-tallest building in Norway. (It's unclear if structures including churches and radio towers count.) A large public swimming pool complex, also constructed built with engineered wood, is attached to the tower. A structure where even the elevator shafts (!) are constructed entirely from CLT, Mjøstårnet's timber structural elements including glulam beams and columns were supplied and installed by leading Scandinavian wood products firm Moelven. "We want to create a sustainable future using wood, explains Moelven CEO Morten Kristiansen in a press release. "The Mjøstårnet project is yet another proof of what is possible to build with timber, and we hope that this building will inspire others to choose more sustainable and climate-friendly solutions in the years to come." While we’ve got you, be sure to mark your diary for our 4th annual WoodWorks - Changing Perceptions Conference running on 3-4 September in Rotorua. By then we’ll have plenty more case studies to showcase. Talk of strained relations between New Zealand and China has led to fears of trade reprisals - but one expert says the Asian superpower has been “all bark and no bite” with its threats in recent years. Richard McGregor, an Australian journalist who spent nearly a decade as the Financial Times’ Beijing and Shanghai bureau chief, has also dismissed the suggestion that countries like Australia and New Zealand are “reliant” on China for economic success. Speaking at Victoria University of Wellington’s Global China Seminar earlier this month, McGregor said New Zealand was not the only country “wrestling with China”. While China was a powerful country, it had very few allies, either in a formal sense or through close friendships. Instead, it had pursued more temporal, opportunistic relationships with nations, having forged ties with a number of countries through its One Belt One Road initiative. Forestry in New Zealand can trace its beginnings back to the tree nurseries of Whakarewarewa (near Rotorua) established after the Mount Tarawera eruption in the late 1800s. In the years that followed, the nursery was home to the first experiments of New Zealand’s young forestry industry. That work went on to set the New Zealand nursery standard for commercial nursery practices and was established as world class. Our proud history of nursery-based science continues today. Our research, development and expertise in nursery operations, propagation and mass production of a diverse range of species supports sustainable forestry that delivers economic and environmental benefits to all New Zealand. 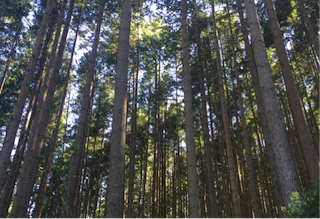 To ensure we are up to the challenges ahead in forestry and tissue culture science, this year Scion will build the first ‘pilot’ stage of a new nursery, specifically aimed at meeting novel science and commercial challenges in exotic and indigenous forestry. Changes are afoot in forestry. As we face significant challenges within the existing forestry nursery industry, such as labour shortages, changing chemical and waste management legislation, shifts in weather patterns and more, it is time to re-invent our nursery and how we grow trees. The future is in high spec, hygienic, mechanised nurseries with high throughput of seedlings and clonal material. The opportunity for indigenous propagation is also significant. Indigenous forestry is now in its infancy, not dissimilar to radiata pine 70 years ago, and Scion is ready to lead the way once more. 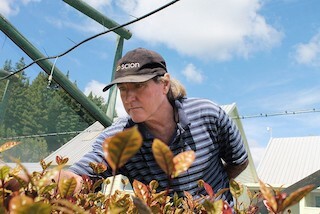 Scion’s Nursery Research Scientist Craig Ford says, “Our aspiration is that the New Zealand forest nursery industry becomes a leaner and more sustainable industry which provides more attractive, skilled work opportunities. Ultimately, we aim to facilitate integrated tissue culture and highly automated nursery propagation for exotic forestry into mainstream practice and to carry out more novel science in indigenous forestry." The first phase of the Scion Nursery redevelopment will cost around $1 million. It will be a small scale, modular, automated, lean-flow, environmentally sustainable propagation facility. New facilities will allow Scion to pioneer and showcase more environmentally and economically sustainable production systems through improved ergonomics, hygiene, water, frost and heat management options, and improved growing media and growing container options. Such facilities will help industry move away from chemicals, plastics, non-sustainable growing media and a reliance on nonrenewable energy for heating and lighting. It will use several new-to-New Zealand forest nursery machines and techniques, such as automated paper pot sowing lines and containerised mini-hedge tunnels (mother stock for rooted cutting production of high-value genetic material). With its emphasis on reducing carbon emissions linked to greenhouse gases and global warming, the initiative is also a key part of the Paris climate agreements to limit temperature rise. According to Indonesian Minister of Environment and Forestry Siti Nurbaya, Indonesia has decreased the annual deforestation rate from 1.09 million hectares to 480,000 hectares between 2014 and 2017. The archipelago’s tropical forests play an important role in absorbing carbon and are home to indigenous communities and rare wildlife and biodiversity. Based on estimates of averted carbon dioxide emissions – some 4.8 million tons – Norway will pay Indonesia an amount expected to be in the range of roughly USD 24 million. Norway and Indonesia are still negotiating the transaction, and the funds are anticipated to be used by the Indonesian government to help underwrite environmental initiatives. “The calculation of the emission reduction is similar to what is done for other countries, i.e. a historical average as the reference level, and emissions below that is considered an emission reduction,” explains Arild Angelsen, a professor of economics at the Norwegian University of Life Sciences and REDD+ expert. Now a decade old since it first came about as REDD (sans ‘+’), the REDD+ program is now seeing countries reach the stage when they can be paid for the fruition of their efforts. Brazil reached a landmark agreement this year and is expected to receive about USD 96 million for reducing 19 million tons of emissions, although some questions remain about the accuracy of the program and the country’s commitment to deforestation due to recent changes in its government. In Southeast Asia, Vietnam completed key REDD+ requirements at the end of 2018 and is now eligible to receive payments as well. “Compared to the payments to Brazil, [the payment to Indonesia] is small, but compared to past payments to Indonesia, it’s not,” says Angelsen. Indonesia is home to the third-largest swath of rainforest after Brazil and the Democratic Republic of Congo. But in recent years, drought, wildfires, logging, salt water intrusion and palm oil plantations have all taken their toll on Indonesia’s forests. 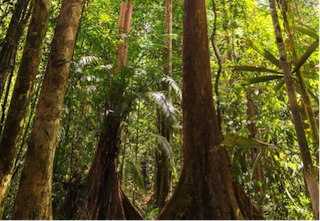 The Southeast Asian nation designates 42 percent of its forests for commercial use. "So," he said, "I have been presented, by both of you, with a bribe." Both lawyers squirmed uncomfortably. "You, attorney Leon, gave me $15,000. And you, attorney Campos, gave me $10,000." "Now then, I'm returning $5,000, and we're going to decide this case solely on its merits." Carlson was charged with stealing a Mercedes Benz, and after a long trial, the jury acquitted him. Later that day Carlson came back to the judge who had presided at the hearing. "Your Honour," he said, "I wanna get out a warrant for that dirty lawyer of mine." "Why?" asked the judge. "He won your acquittal. What do you want to have him arrested for?" "Well, Your Honour," replied Carlson, "I didn't have the money to pay his fee, so he went and took the car I stole."